This colored transparency shows Cedar Crest the official residence for the governor of Kansas. The home designed by the architect firm of Wight and Wight was built in 1928 for the newspaper owner and publisher of the Topeka State Journal Frank P. MacLennan. The three story structure designed as a French chateau, was built on 244 acres of land northwest of Topeka, Kansas. The beautifully designed mansion was briefly occupied by MacLennan before his untimely death in 1933. 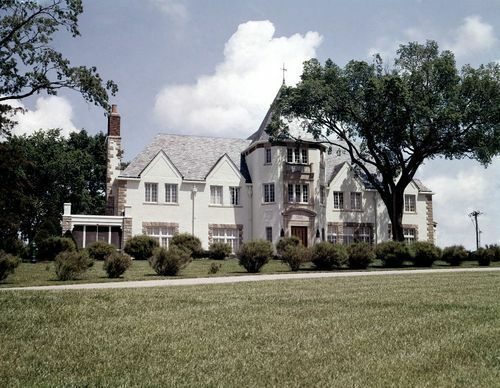 In 1955, his widow Madge Overstreet MacLennan left Cedar Crest and the surrounding land to the state of Kansas, upon her death, to be used as the executive residence for the governor of Kansas. After her death in 1955, the home remained unoccupied for a number of years until the state of Kansas official accepted the residence in 1961. In 1962 after remodeling plans were completed, to the interior of the home, Governor John Anderson became the first governor to occupy Cedar Crest. As governors came and went, changes in décor were made to the home. In 1998, Cedar Crest under went an eighteenth month renovation at a cost of $4.4 million dollars. When completed in 2000 extensive restoration repairs had been conducted from top to bottom, and inside and out. Today, Cedar Crest still stands as a beautiful home for governors and their families. Free public tours are conducted every Monday afternoon at the mansion.